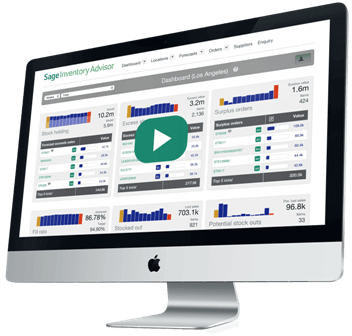 Sage Inventory Advisor is the premiere software add-on solution for Sage ERP users who need improved inventory management today. Accurate forecasting and optimal refill orders are just a few clicks away. Through the application's unique and user-friendly dashboard, users can see exactly what's going on with their inventory, what needs to be addressed immediately, and what potential stock-outs are on the horizon. Sage Inventory Advisor requires minimal implementation time and offers an impressively low-cost monthly fee. Users' ROI with this application is massive, and the time savings allows for better overall inventory management. Better still, it is a truly cloud-based solution, meaning users can access the software's full functionality from virtually anywhere. Integrated how-to videos explain the dashboard's functionality and enable users to fully implement inventory best practices. "We use Sage Inventory Advisor every day to get a snapshot of our inventory; fill rates, stock outs and forecasts, helping us to set realistic goals for all aspects of our business. We can’t live without it!" "The process of creating purchase orders and dealing with supply issues is now very efficient; Sage Inventory Advisor has become crucial to helping us achieve our aim of 100% customer satisfaction." Developers of the very popular Sage Inventory Advisor, the core team and founders at NETSTOCK have been involved in Inventory Replenishment, Management, and Optimization since the late 1980′s. Want to Learn More or See a Live Demo?